If you’re going to spend in this price range you should definitely expect to get more for your money than the average consumer. Power, performance, design, usability – you’re paying more, you should expect more. There are only a couple of products in this particular price category – Tyent’s 9090 TURBO Extreme and Enagic’s Leveluk DXII. We’ll take a look at the “bang for your buck” factor on these two models starting with the most expensive. This model retails for $3,495 and definitely delivers on power, performance, styling and ease of use. With 9 hybrid-mesh electrodes and up to 375 watts of SMPS power, Tyent’s 9090 TURBO Extreme is definitely an industry front-runner . This machine is able to produce water with a pH range of 2.5 – 11.5 in many areas across the country. And you’ve got styling options. The stainless steel face is standard on all 9090 TURBO models but customers also have a choice between black or white casing – allowing them to match their Tyent water ionizer to other countertop appliances in the kitchen. Advanced features include ease of use, fully adjustable presets and 9090 TURBO water ionizers are shipped with upgraded “Ultra Filtration” which filters down to .01 microns. Every individual preset on the Tyent 9090 TURBO Extreme can be customized based on your source water – an important feature as some areas require more or less power to produce the same levels of water. The advanced settings are intuitive and make adjusting the performance of the unit at each preset very easy. This 9090 TURBO Extreme has a dual internal filtration system – the first filter removes common contaminants and filters particles and bacteria down to .01 microns. The secondary ceramic filter adds another layer of protection, filtering out pathogens common in tap water, additional contaminants and then pre-conditioning the water for ionization. The control panel features “one touch operation.” Once water is supplied to the unit, the on/off mechanism is your selection of the type of water you want to produce. Your selection is confirmed on the control panel screen by color indicator, voice alert and flashing of the icon for the level you’ve selected. To stop production, simply touch the same icon. wasting water and filter life. The unit can be restarted immediately by touching the control panel again. The Tyent 9090 TURBO has an alternate installation option for modern kitchens with upgraded pull-out sprayer faucets. Instead of connecting the unit directly to the faucet, the unit can be plumbed directly into the cold water line below the sink. A small hole is required to bring the water supply line up to the unit and the additional adapter for this installation can be purchased through any Authorized Tyent Dealer. Basic cleaning is automated by timer and sensor with a special cleaning cartridge available for annual cleaning. Tyent recommends running the cleaning cartridge once every six to nine months in hard water areas and once every 12 to 18 months in other source water areas. With the industry standard being seven plates, the Tyent 9090 TURBO Extreme stands out with its nine hybrid-mesh plates and 375 watts of power. Another stand-out feature is the styling choice. The optional black or white casing with the standard stainless steel face is an “extra” you might expect when paying more for a product. Investing $3,290 in Enagic’s Leveluk DXII will get you a five plate water ionizer operating at a maximum of 200 watts. 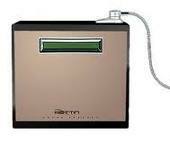 Enagic uses solid/flat electrodes and transformer power systems in all of their water ionizers. The single filter is rated to remove chlorine and lead for up to 12 months. You’ll also get a reusable cleaning cartridge and a year’s worth of cleaning supplies for your investment. As far as the advanced features most consumers expect when purchasing a water ionizer in this price range, the DXII doesn’t have a lot to offer. This model does have an LCD display that indicates the level of water being produced as well as voice alerts. There is also an automated cleaning cycle that runs based on timer. Unfortunately, there are no options to adjust the power used at each preset. Presets on all Enagic water ionizers are set at the factory. The only option users have to adjust the strength of the water at each preset is to increase or decrease the rate at which water flows through the unit. You do this by increasing or decreasing the flow of water coming through the faucet to the diverter. As far as performance, you’ll be able to get a pH range of 4.0 to 9.5 using water from your tap. Stronger pH levels – 2.5 to 10.5 can be produced using Enagic’s Electrolysis Enhancer solution. Enagic advises not drinking water produced using the enhancer solution or using this water for cooking or making coffee or tea – water produced using the enhancer solution is not suited for consumption. When it comes to looks and design, the DXII is actually more attractive than the higher priced Enagic SD501 model but it still lacks the styling of many other water ionizers on the market for less. It’s relatively compact and having access to the filter area from the front of the unit is convenient when it’s time to change the filter or run the recommended manual cleaning procedure. The DXII’s automated cleaning cycle will run periodically based on an internal timer and Enagic offers a reusable cleaning cartridge for regular maintenance. The company recommends using the cleaning cartridge once every two to four weeks and “deep cleaning” the unit once every six months in hard water areas and once every nine to 12 months in other source water areas. The warranty on this model is below the industry standard 5 years covering parts and labor. Enagic backs their Leveluk DXII water ionizer for three years covering both parts and labor. Overall, the DXII is a good basic water ionizer. If properly maintained it will produce good quality water for many years. The control panel is basic and relatively easy to use. What’s missing on this model are the “extras” most customers expect when paying extra for a product. Do your homework, and do a little shopping around. The prices here are the full retail price and some of these models can be found on sale. But be a smart consumer – if you find a price that is way below what everyone else is asking for the same product – or a “package deal” with more “freebies” than anyone else is offering – think twice about it. Authorized dealers in good standing adhere to the sale and pricing guidelines set by the companies they represent. Those “better than the rest” deals you find may leave you with a product that isn’t covered by warranty.